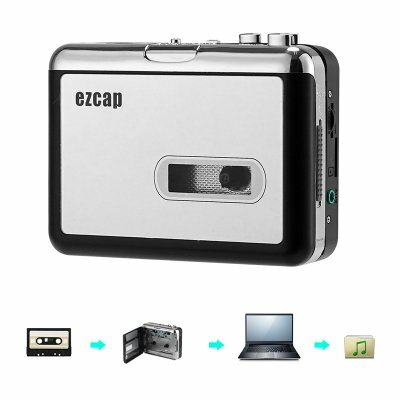 Successfully Added Cassette To MP3 Converter - No PC Required, 32GB SD Card Support, 3.5mm Audio Jack, Music Play Back, 2x AA Battery to your Shopping Cart. This cassette tape to MP3 converter is the perfect gizmo for those of you that still have some old cassettes lying around. It allows you to easily convert the music on your old tapes to MP3 files so that you’ll be able to listen to them from your PC or laptop. Thanks to its simple plug and play design, you’ll be able to simply insert your cassette and start converting. This cool electronic gadget will then automatically copy and store all your classic songs onto a micro SD card. By supporting up to 32GB, you can be guaranteed that there will always be enough space for you to keep your favorite songs. With its play back function and 3.5mm audio jack, this cassette to MP3 converter allows you to instantly listen back your MP3 files. Therefore, you can be guaranteed that all your converted music will be of the highest quality. Additionally, this cool electronic gadget can also be used as a regular cassette player for those of you that simply like to relive old times. As your music converter stores all your songs instantly on a micro SD card, you won’t need any PC to turn your cassettes into MP3 files. This allows you to copy all your songs at great ease with the simple touch of a button. If you would like to get rid of all those old cassettes lying around, or simply like to store your favorite classics on your PC, then this gizmo is the perfect tool for you. This cassette converter comes with a 12 months warranty, brought to you by the leader in electronic devices as well as wholesale electronic gadgets..